In the boom years of the 1960s and 1970s, Hong Kong people demanded increasingly sophisticated dining options to match their swelling pocketbooks, and what they got was the cha chan teng. Under names like "The Gloucester" and "The Cherikoff," these neighborhood restaurants attempted to present a reasonable simulacrum of Western-style cuisine but in practice served heavily syncretic fare. The likes of soya sauce chicken spaghetti or pork chop with applesauce and steamed rice became the stuff of fashionable Friday nights, washed down with things like yin-yang (coffee and tea, mixed in the same cup). Several cha chan teng have survived, serving the same kind of food, but now they're a cult thing  visited by young people looking for their childhoods in salads of tinned fruit cocktail and mayo, with side servings of irony and retro decor. 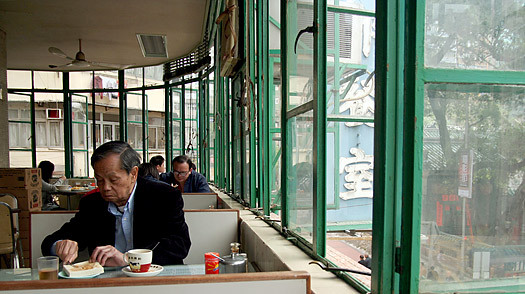 Try Mido Café (nearest MTR: Yau Ma Tei) in Kowloon  much beloved by art directors for its well preserved '60s interior  or the perennially popular Tsui Wah (nearest MTR: Central) on Hong Kong Island.